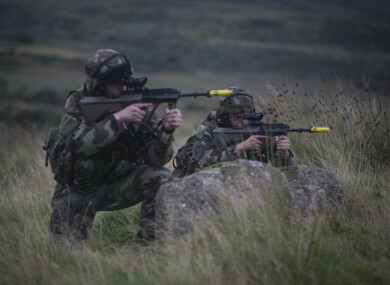 THE ASSOCIATION REPRESENTING members of the Irish Defence Forces has said poor pay and conditions are pushing members out of the job and discouraging new recruits from joining. PDFORRA revealed today that some 2,840 members left the Defence Forces in the last five years – that’s over 30% of the total enlisted personnel. Over 1,000 members purchased their discharge – paying a sum of €300 – in those five years, the association said. The Defence Forces is currently arranging a second general service recruitment campaign for later in the year. Speaking today, general secretary of PDFORRA Gerry Guinan was critical of the report from the Public Service Pay Commission earlier this year, which identified issues with recruitment in the Defence Forces – but only in specialist areas. “This analysis failed to consider the underlying facts surrounding recruitment and retention in the Defence Forces. Currently, the numbers have dropped through the floor with only 8% of those who express an initial interest in joining actually reaching a stage where they could be selected,” he said. The current recruitment campaign is essentially a failure, as it is not solving the problem – and is not reflective of the tireless efforts by the professionals who run these campaigns. The failure to recruit lies in these simple facts; people joining the force do not have the security of tenure enjoyed by other public servants, their pay is amongst the lowest in the public service and they do not enjoy the protections of basic employment legislation, like the Working Time Directive. Guinan said that if the Department of Defence was serious about trying to recruit personnel, it would need to offer “comparable pay and conditions of service to that generally enjoyed in the wider public service”. Email “Over 1,000 Defence Forces members bought their way out in the last five years”. Feedback on “Over 1,000 Defence Forces members bought their way out in the last five years”.